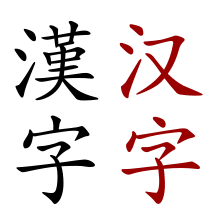 An Tsino nga agi (iningles: Chinese character) agsob liwat tawagon nga Agi nga Han (yano nga Tsino: 汉字; tradisyonal nga Tsino: 漢字; pinyin: Hànzì), usa ka logogramo nga gingagamit pagsurat hin Tsino (hanzi), Hinapon (kanji), ngan danay Kinoryano (hanja), ngan an una nga Vinitnames (hán tự), ngan iba pa nga mga pinulongan. Galambos, Imre (2006). Orthography of early Chinese writing: evidence from newly excavated manuscripts. Budapest: Eötvös Loránd University. ISBN 978-963-463-811-7. http://shahon.org/wp-content/uploads/2010/02/Galambos-2006-Orthography-of-early-Chinese-writing.pdf. Samuel Wells Williams (1842). Easy lessons in Chinese: or progressive exercises to facilitate the study of that language. Printed at the Office of the Chinese Repository. http://books.google.com/books?id=djnPbjYGHFIC&printsec=frontcover&source=gbs_ge_summary_r&cad=0#v=onepage&q&f=false. Herbert Allen Giles (1892). A Chinese-English dictionary, Volume 1. B. Quaritch. pp. 1415. http://books.google.com/books?id=l3EgAQAAMAAJ&printsec=frontcover&source=gbs_ge_summary_r&cad=0#v=onepage&q&f=false. P. Poletti (1896). A Chinese and English dictionary, arranged according to radicals and sub-radicals. Printed at the American Presbyterian mission press. pp. 307. http://books.google.com/books?id=f6VBAAAAIAAJ&printsec=frontcover&source=gbs_ge_summary_r&cad=0#v=onepage&q&f=false. William Edward Soothill (1900). The student's four thousand [characters and general pocket dictionary] (2 ed.). American Presbyterian Mission Press. pp. 420. http://books.google.com/books?id=8nwuAAAAYAAJ&printsec=frontcover&source=gbs_ge_summary_r&cad=0#v=onepage&q&f=false. John Chalmers (1882). An account of the structure of Chinese characters under 300 primary forms: after the Shwoh-wan, 100 A.D., and the phonetic Shwoh-wan, 1833. Trübner & co.. pp. 199. http://books.google.com/books?id=fBMTAAAAYAAJ&printsec=frontcover&source=gbs_ge_summary_r&cad=0#v=onepage&q&f=false. Chinese and English dictionary: compiled from reliable authors. American Tract Society. 1893. pp. 348. http://books.google.com/books?id=rDQrAAAAYAAJ&printsec=frontcover&source=gbs_ge_summary_r&cad=0#v=onepage&q&f=false. Joseph Edkins (1876). Introduction to the study of the Chinese characters. Trübner & co.. pp. 314. http://books.google.com/books?id=_YdBAAAAYAAJ&printsec=frontcover&source=gbs_ge_summary_r&cad=0#v=onepage&q&f=false. Kangxi (Emperor of China) (1842). Chinese and English dictionary: containing all the words in the Chinese imperial dictionary; arranged according to the radicals, Volume 1. Printed at Parapattan. http://books.google.com/books?id=h380AQAAIAAJ&printsec=frontcover&source=gbs_ge_summary_r&cad=0#v=onepage&q&f=false. Sampson, Geoffrey; Chen, Zhiqun (2013). The reality of compound ideographs. 41. 255–272. http://www.grsampson.net/ARoc.pdf. Chinese and English dictionary: compiled from reliable authors. American Tract Society. 1893. http://books.google.com/books?id=rDQrAAAAYAAJ&printsec=frontcover&source=gbs_ge_summary_r&cad=0#v=onepage&q&f=false. Ginkúhà dida han 2011-05-15. Kangxi (Emperor of China) (1842). Chinese and English dictionary: containing all the words in the Chinese imperial dictionary; arranged according to the radicals, Volume 1. Printed at Parapattan. http://books.google.com/books?id=h380AQAAIAAJ&printsec=frontcover&source=gbs_ge_summary_r&cad=0#v=onepage&q&f=false. Ginkúhà dida han 2011-05-15. Ini nga pakli kataposan nga ginliwat dida han 12:30, 21 Disyembre 2016.